1Two-parent households with a mother who does not work outside the home have grown much less common in the U.S. since 1970. Today, both parents work full time in 46% of these households. 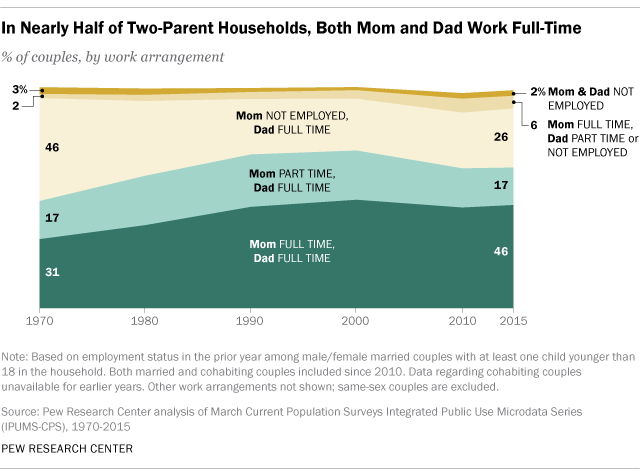 Only about a quarter of two-parent households now consist of a full-time working father and a mother who is not employed. By comparison, in 1970, both parents worked full time in just 31% of two-parent homes, while a full-time working dad and a stay-at-home mom made up a 46% plurality of them. 2 In homes with two full-time working parents, most parents say chores, discipline and quality time with kids are shared equally, but scheduling and sick days fall more on mom. About six-in-ten American parents in these dual-earning households say they share responsibility evenly for playing or doing activities with children, disciplining children, and taking care of chores. However, when it comes to certain activities, about half of parents still say mom takes the lead. 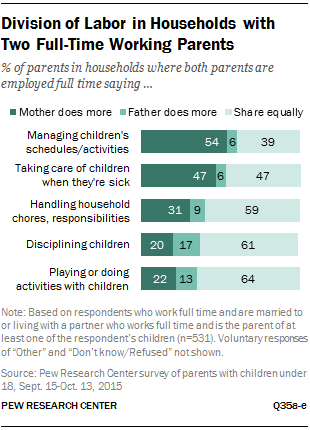 Some 54% of parents in households with two full-time working parents say the mother does more to manage the children’s schedule and activities, while 39% say this task is shared equally and 6% say the father does more. And 47% say the mother takes on more when their children fall ill, equal to the share saying they split this duty equally; just 6% say the father does more of this. But moms and dads don’t have the same perception of the division of labor. Fathers are more likely than mothers to say the responsibilities are shared equally, but mothers are more likely to say they take on the larger role in many of these tasks. 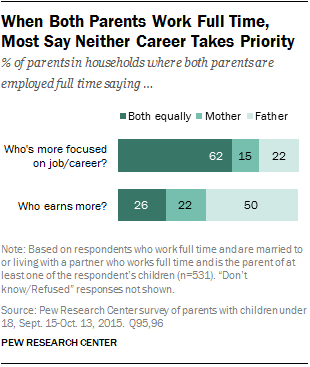 3 When both parents in a household work full time, most say neither’s career takes priority, but half say dad makes more money. Some 62% say the mother and father are equally focused on their careers, while 22% say the father is more career-oriented and 15% say it’s the mother. Despite this widespread equity in parents’ focus on their careers, half in families with two full-time working parents say the father earns more than the mother. In the other half of these households, the parents report that either the salaries are roughly equal (26%) or the mother earns more (22%). In a previous report, we found a rise in women serving as breadwinners for their families since the 1960s. Most of this growth has been due to the rise in single mothers, but about 40% of the growth in breadwinner mothers is due to married mothers who earn more than their husbands. Our analysis of Census Bureau data found that in 2011, 15% of households with young children were comprised of a wife who out-earned her husband. 4Working mothers are more likely than fathers to say parenting has interfered with their career advancement. Overall, the survey suggests that being a parent doesn’t necessarily interfere with career advancement – a majority of working parents (59%) say being a parent has made it neither harder nor easier to advance in their job or career, while three-in-ten say it has made their trajectory harder and one-in-ten say it has made it easier. However, a larger share of mothers (four-in-ten full- and part-time moms) than fathers (just two-in-ten) say being a working parent has made it harder to advance in their careers. 5 For many working parents, there’s just not enough time. About four-in-ten full-time working mothers say they spend too little time with their kids. By comparison, 18% of part-time working mothers and 11% of non-working mothers say the same. For their part, working fathers are significantly more likely than working mothers to say they spend too little time with their children – fully half of full-time working fathers say this is the case. Time with children isn’t the only area where full-time working parents are feeling the squeeze – 55% say they don’t spend enough time away from their children to get together with friends or pursue hobbies, and among those who are married or cohabiting, 42% say they spend too little time with their partners. Roughly equal shares of full-time working moms and dads say they have too little time in these areas.